Barbara: Don’t flatten; make room for the train. We first meet Walter Vale (Richard Jenkins) with his back to us. When the knock at his door that he has been waiting for finally comes, he still hesitates before opening it. He lives alone; he eats alone. Essentially, he embodies the state of being alone. Classical piano fills the air of his fully decorated house yet it still feels just as cold and lonely as its sole inhabitant. No matter where he is, he never looks like he belongs or that his mind is present. Walter Vale is a visitor in his own life. 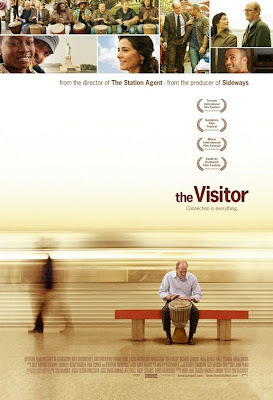 THE VISITOR follows Walter as he begrudgingly makes his way from his cushy comfort zone in Connecticut to his longtime empty New York City apartment. Much to his bewilderment and less so his surprise, Walter finds that two people have made themselves at home in his absence. 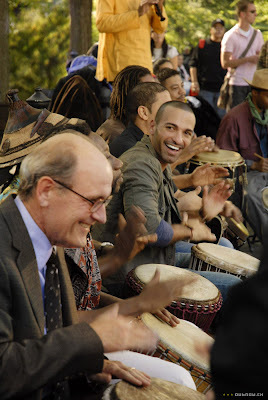 Illegal immigrants, Tarek and Zainab (Haaz Sleiman and newcomer Danai Gurira) unknowingly rented an apartment that already belonged to someone else and rather than put them out on the street or call the police, Walter lets them stay until they’ve made other arrangements. His compassion and the little effort it took to exert it catches him completely off guard and it isn’t long before an odd couple friendship develops with the outgoing Tarek. Suddenly, the man who had grown complacent in his solitary existence finds himself sharing his space and his life with other people for what seems like the first time since his wife passed away years before. Jenkins’s gentle performance is THE VISITOR’s heart. It is as though he is constantly in hushed, private awe of the new facets of his personality he is discovering with each fresh experience. While he once found solace in structure and routine, he is now seeing that these comforts were slowly killing his soul. And with his eyes finally open, he can see that America’s visitors bring a color to the country that would kill its soul if it were taken away. So as Walter beats the drum that Tarek taught him how to beat, THE VISITOR beats its own in a language that is universally understood.